Brought up as a Christian, Marina Nemat’s peaceful childhood in Tehran was shattered when the Iranian Revolution of 1979 ushered in a new era of Islamic rule. After complaining to her teachers about her Maths lessons being replaced by Koran study, Marina was arrested late one evening. She was taken to the notorious prison, Evin, where interrogation and torture were part of the daily routine. Aged sixteen, she was sentenced to death. Her prison guard snatched her from the firing squad bullets but exacted a shocking price in return: marriage to him and conversion to Islam. Marina lived out her prison days as his secret bride, spending nights with him in a separate cell. Marina struggled to reconcile her hatred towards Ali and her feelings of physical repulsion with the fact that he had saved her life. When Ali was murdered by his enemies from Evin, and saved Marina’s life for a second time, her feelings were complicated even further. At last she was able to return home, to her family and her past life, but silence surrounded her time as a political prisoner and the regime kept her under constant surveillance. 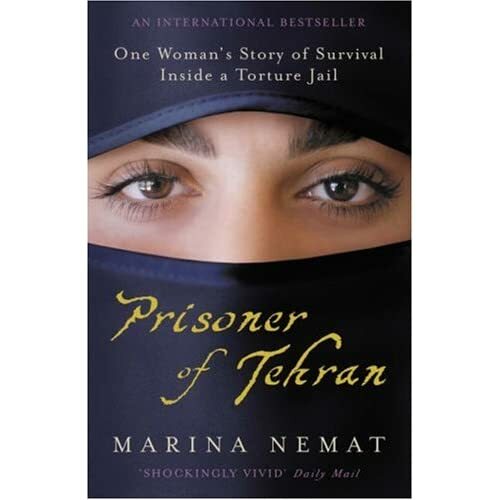 Marina’s world had been changed forever and she questions whether she will ever escape Iran and its regime or be free of her memories of Evin. This entry was posted on December 7, 2010, 7:03 pm and is filed under Books. You can follow any responses to this entry through RSS 2.0. You can leave a response, or trackback from your own site.